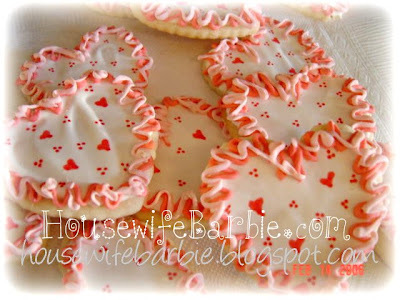 An American Housewife: Let's Make Our Valentines Day Cookies! Cream the sugar, butter and shortening. Add the egg, milk and vanilla. Add the flour, baking powder and salt then mix just to blend. Chill dough for at least 2 hours. Roll about 1/4 inch thick on a lightly floured surface and cut into shapes. Bake on parchment lined cookie sheets for approximately 8 minutes at 370 degrees. A 'Royal Icing' recipe you can use if you would like (what I used on the cookies I made in the photo above) must be kept covered when not in use as it dries quickly, and on the finished product, dries hard. This works great for travel and stacking, or in children's Valentines Goody Bags as I made for my daughter. (add more or less water depending on stiff it is and how stiff you want it). I also used 'edible' food color markers to make the hearts. Do you need cookie cutters? Goodie Bags? Edible food color markers or baking pans?